An exclusive estate for the world’s elite, Finca del Rey unfolds over ancient olive groves and lavender-dusted hillsides, mountain panoramas and spectacular sunsets. The finest of Spain's country estates, gazing over the scenic Sierra Morena. Designed around panoramic views of the mountains and sunset, and offering every imaginable luxury, Finca del Rey is a blend of modern style and traditional Spain. A home that embraces apparent contradictions, Finca del Rey is both expansive and intimate, somehow regal yet cosy, simultaneously stately and warm, at once modern and traditional. Designed to exceed the exacting tastes and stringent requirements of the world’s elite, the exclusive Finca del Rey is a sprawling 4,400 square-metre property, with 14 en-suite bedrooms, a full staff, modern style, and traditional Spanish flair, in an environment of warm hospitality and professional discretion. Here, no expense has been spared. Located in one of the most beautiful enclaves in the country, Finca del Rey unfolds over 7,400 acres in Castilla La Mancha, the land of Don Quixote: home to authentic Spanish flavour and ancient traditions, and yet just hours by private plane from Europe’s major hubs. This is a place of warmth and intimacy, of 5-star services and next-level luxuries: food and wine (all-inclusive), an in-home spa with Turkish bath, a private runway, breath-taking sunset views and Sierra Morena mountain panoramas. Designed to meet the needs of exclusive travellers – luxury, discretion, security and total privacy – Finca del Rey is an estate like none other. Exquisite attention to detail is evidenced in every room and in every feature, extending throughout the home and out onto the estate’s scenic 3,000 hectares (over 7,400 acres). The home itself offers lavish interiors, distributed over two wings and one annexe: one wing to house the main living, dining and entertainment areas, and another wing plus annexe to host the guest living room and bedrooms, thus ensuring privacy and a quiet night’s rest. Floor-to-ceiling glass walls wrap the home, opening in warmer months for al-fresco living and dining. Private staff attends your every need, including culinary. Integrated music and sound systems outfit every bedroom and living space. Multiple lounges invite diversion. Two pools and a spa beg you indulge in total relaxation. Indeed, Finca del Rey pays attention to its details. Explore the 3,000 hectare Estate by quad, horseback, bike or 4×4. Here, perched atop a hill with commanding 360º panoramic views, the Sierra Morena mountains rise into endless blue skies; huge expanses of flower-dappled hillside roll into ancient olive groves; lush vegetation blankets deep valleys and steep ravines; and sunsets dip over the distant horizon. This is the Spain – these are the panoramas, the scenery, the seclusion, and the service – that the world’s aristocracy has enjoyed for centuries. The Spain that you can now enjoy, too. The estate’s private runway, which receives both domestic and international flights, connects Finca del Rey to Paris, London and Rome in just two hours; New York City is a mere six-hour flight away. Here, the only limits are those in your imagination. Finca Del Rey has a team of staff on-site who will provide daily housekeeping, all meals and a full linen change at least every 3 days. They also attend the pool and garden and can supply fresh towels for the pool and spa as well as undertake personal laundry and ironing. This property has a Concierge/Property Manager and an Events Manager employed directly by the owner to assist you personally with anything you require before and during your stay. 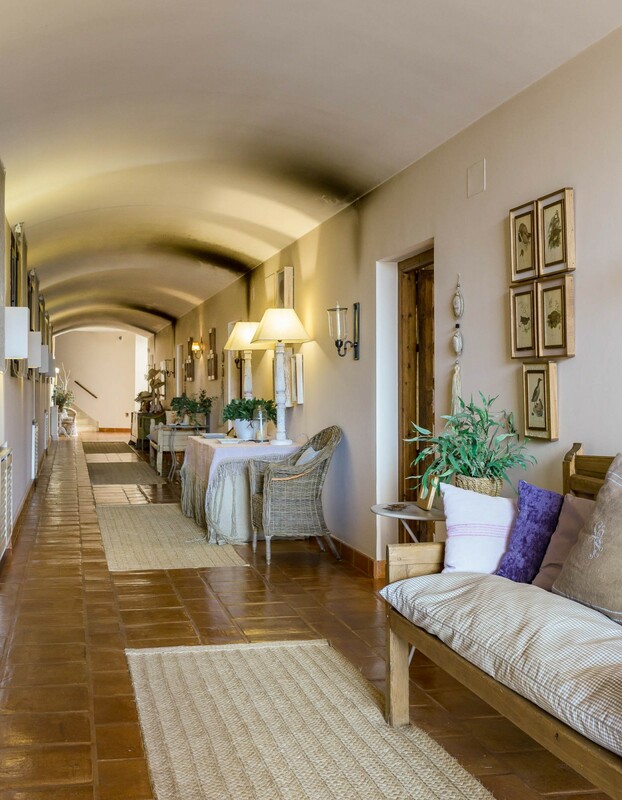 This villa is within reach of several of Spain’s major cities where you can browse the shops, visit ancient monuments and eat in the best restaurants. We work closely with the best local suppliers who can organise an escorted tour to help make your stay extra special. At the Estate, we can organise all kinds of outdoor activities from 4×4 Jeep Safaris, Cycling, Quad Bikes, Horse Riding, country picnics, Tennis and Archery, Clay Pigeon Shooting or Partridge Hunting. This villa can be enjoyed as part of a fully-inclusive stay. Your breakfast, lunch and dinner will be prepared each day based on your choice of menus agreed before travel. Dishes focus on seasonal local produce and include Spanish wine (other international wines can be ordered in advance). A snack and after-dinner drinks bar can also be served and there is a complimentary tea and coffee service available throughout the day. We would be happy to organise visits to nearby wineries or local food producers as this area is very close to the Valdepenas wine region. This villa has several vehicles with drivers that can be requested by guests for trips to nearby towns, shuttles to the airport, etc. Advance reservations where possible. Clients arriving into the estate’s own airfield or heliport will be transferred to the house. We would be happy to organise transfer shuttles or helicopters from the nearest airports, or assist with reserving your choice of hire car for use during your stay. Finca del Rey’s sprawling living space is a celebration of mountain views, leisure and complete relaxation. The main living space opens through large glass walls, to reveal a vast, south-facing terrace that spans the length of the home. Here, two separate, shaded seating areas offer panoramic views that stretch over the estate’s hills and out to the Sierra Morena mountains and stunning sunsets. The cosy, ground-floor guest lounge is ideal for small groups seeking privacy and discretion: a dining area, snug living area that rings the fire, family movie room with large-screen TV and drop-down projector, and even a piano nook for family sing-alongs. A Gentlemen’s Lounge is the perfect spot for afternoon tea and coffee, or to enjoy the evening bar compliments of the house. A large game room features a Technogym, free weights, table tennis, and kids’ TV/play corner. Additionally, there is a complete spa with a sauna and Turkish bath, two massage rooms, and a special relaxation area. Finca del Rey’s resident staff cooks and serves your meals in three different dining rooms: the formal main dining room, the informal dining room, and the country pavilion. The formal dining room seats 24 guests and offers a fireplace and elegant décor – the perfect medieval-style banquet hall in which to entertain. The informal dining room seats 28, and offers panoramic mountain views and glass walls that open for al-fresco dining in summer. Outdoors, the country pavilion offers a dedicated campo dining room with a roaring log fire (+ wood-burner for winter) and complete service kitchen. Outdoor seating may be set up for an open-air country lunch. Breakfast or afternoon tea can also be taken in the main living room, in the guest living room, or out on the terrace. Please note that the kitchen is for the exclusive use of Finca del Rey staff. Step down from the main terrace and into the pool area, where an adult infinity pool flanks a shallow children’s pool, with beach-style entrance. Swim some laps or just stretch out; there are plenty of sunbeds. Finca staff is on hand to serve drinks or fruit. There is a sound system in each bedroom and all living spaces. A dedicated TV lounge offers a large-screen television, drop-down projector screen, sound system, popcorn machine, and ample seating. Children will enjoy the separate lounge/games area, which adjoins the gym and table tennis area. Bedroom 1: First bedroom off main corridor: Enter to the dressing area with wardrobe and safety deposit box; through to the bathroom and bedroom, decorated in pale olive-coloured décor and offering a super-king bed (2.10 metres) and sitting area, which opens onto a small patio with table and chairs. The terracotta en-suite bathroom has twin basins, a bathtub with shower attachment, separate shower enclosure, and views to the mountains. Bedroom 2: Second bedroom off main corridor: Enter to the dressing area with wardrobe and safety deposit box; through to the bathroom and bedroom, decorated in pale cream and terracotta French-style décor and offering a super-king bed (2.10 metres), dressing table, and sitting area, which opens onto a small patio with table and chairs. The mahogany en-suite bathroom has twin basins, a bathtub with shower attachment, separate shower enclosure, and views to the mountains. Bedroom 3: Third bedroom off main corridor: Enter to the dressing area with wardrobe and safety deposit box; through to the bathroom and bedroom, decorated in barley and terracotta coloured French-style decor and offering a super-king bed (2.10 metres), dressing table, and sitting area, which opens onto a small patio with table and chairs. The mahogany en-suite bathroom has twin basins, a bathtub with shower attachment, separate shower enclosure, and views to the mountains. Bedroom 4: Fourth bedroom off main corridor: Enter to the dressing area with wardrobe and safety deposit box; through to the bathroom and bedroom, which offers a super-king bed (2.10 metres) and sitting area with opulent velvet chairs and an oak dresser. The modern stone and white en-suite bathroom has twin basins, a bathtub with shower attachment, separate shower enclosure, and views to the mountains. Bedroom 5: The second master and fifth bedroom off main corridor: This is a longer room with a 3-piece elegant French Louis XV suite, antique dresser and regal headboard. Enter to the dressing area with wardrobe and safety deposit box; through to the bathroom and bedroom, with a super-king bed (2.10m) and living area leading out to small private patio with table and chairs. The modern slate grey en-suite bathroom has twin basins, a bathtub with shower attachment, separate shower enclosure, and views to the mountains. Bedroom 6: The master suite and sixth bedroom off main corridor in the corner: this is a large suite promising added privacy. It has a split-living area with chairs and a desk in warm autumnal tones, antique dresser, romantic canopy headboard, large dressing area with wardrobe and seating, and safety deposit box. Doors open off the living area to the bathroom and bedroom, with super-king bed (2.10m) and living area; Enjoy a small private corner patio with table and chairs. The en-suite bathroom, the largest in the home, has twin basins, large shower enclosure, oversized sunken bath, and magnificent views to the mountains. Bedroom 7: The final bedroom off main corridor, opposite bedroom 6 at the rear of the home: It is smaller than the other bedrooms but has a lovely four-poster king bed and French armchairs with William Morris soft grey fabrics. Views of olive trees and fountains. (No patio.) The modern white en-suite bathroom has twin basins, bathtub with shower attachment, and separate shower enclosure. Bedroom 8: The first bedroom off the top-floor corridor: Enter to the dressing area with wardrobe and safety deposit box; through to the bathroom and bedroom, which offers an antique dressing table and twin beds with turquoise headboards. This bedroom can also be configured as a triple bedroom for children or with super-king size bed. Far-reaching views to the mountains. (No balcony.) The terracotta en-suite bathroom has twin basins, a bathtub with shower attachment, separate shower enclosure, and views to the mountains. Bedroom 9: The second bedroom off the top-floor corridor. Enter to the dressing area with wardrobe and safety deposit box; through to the bathroom and bedroom, with super-king bed, a handmade headboard, and cream and autumnal colours to complement the natural landscapes. Far-reaching views to the mountains. (No balcony.) The mahogany en-suite bathroom has twin basins, a bathtub with shower attachment, separate shower enclosure, and views to the mountains. Bedroom 10: The third bedroom off the top-floor corridor: Enter to the dressing area with wardrobe and safety deposit box; through to the bathroom and bedroom, with super-king bed, regal oak headboard, antique dressing table, sitting area, and autumnal colours to complement the natural landscapes. Far-reaching views to the mountains. (No balcony.) The modern stone and white en-suite bathroom has twin basins, a bathtub with shower attachment, separate shower enclosure, and views to the mountains. Bedroom 11: The fourth bedroom off the top-floor corridor: Enter to the dressing area with wardrobe and safety deposit box; through to the bathroom and bedroom, with incredible mountain views, a super-king bed, sitting area, dressing table, and barley and terracotta French-style décor. The modern slate grey en-suite bathroom has twin basins, a bathtub with shower attachment, separate shower enclosure, and views to the mountains. Bedroom 12: The final bedroom off the top-floor corridor, nearest the far side staircase and panoramic window: Enter to the dressing area with wardrobe and safety deposit box; through to the bathroom and bedroom, with turquoise-green antique headboards, dressing table, and elegant armchairs. Far-reaching views to the mountains. (No balcony.) The mahogany en-suite bathroom is slightly smaller than others but has twin basins, a bathtub with shower attachment, separate shower enclosure, and views to the mountains. Bedroom 13: Located in the poolside annexe with a separate external access. Offers adjoining twin beds with romantic canopy, wicker chairs, stone-washed walls and marble floor. The modern, stone-washed en-suite shower room has twin basins. Bedroom 14: Located in the poolside annexe with a separate external access. Offers adjoining twin beds with romantic canopy, wicker chairs, stone-washed walls and marble floor. The modern, stone-washed en-suite shower room has twin basins. Some of the super-king beds may be separated into twins, per request. Some bedrooms also have space for an additional bed making them triples, or a baby cot. Please ask for details. The serenity of the countryside surrounding Finca Del Rey is totally captivating. Its quite a surprise to find a house of such contemporary design in the middle of it all, but then when you step inside you see the owners have very much stayed true to the style of the homely Spanish hunting estates of times gone by. Its easy to see why the Spanish High-Society would choose to stay here, for it’s a completely private and very welcoming retreat away from the glare of the media. Its quite hard to leave! This estate offers the height of luxury just like a private hotel, complete with daily housekeeping, house chef to prepare all meals and afternoon tea, dedicated Concierge and silver service. The estate comes complete with its own air field for guests arriving in privacy by private jet or helicopter. With a team this experienced at welcoming the upper echelons of Spanish High Society, VIP service comes as naturally as the setting sun! Enjoy your special celebration in Spain exactly as their Nobility do, surrounded by sumptuous interior decor blending characterful traditional features with a modern finish, gaze at grand tapestries and works of art, dine on the Estate’s fine china before retreating in front of the log fire with a choice of after dinner liquers. The villa’s own events planner can organise the most lavish weddings, or special intimate celebrations in the villa’s grounds or the wider estate. This setting offers the most memorable backdrop and guests can be transported in via the private airfield and helicopter landing pad. Enjoy the warmth, intimacy and discretion of a private home, but with the luxury, service and professionalism of a 6-star hotel. Sleep on the finest linens, bathe in complimentary L’Occitane, enjoy waiter service around the pool or evening bar, have staff stoke the fire or arrange a country picnic (in fine-dining style!) to enjoy precious time with loved ones without lifting a finger. At Finca Del Rey you can enjoy the ultimate luxury health retreat; enjoy daily Yoga on the terrace with far-reaching views, energetic walks or horse riding in the countryside, freshly cooked local produce and private beauty treatments in your own private spa. There is accommodation separate to the main house for retreat groups travelling with an organiser, and the kitchen can prepare any manner of diets for your guests. Located in one of the most beautiful enclaves in Spain, Finca del Rey unfolds over 7,400 acres in the land of Don Quixote: home to authentic Spanish flavour and ancient traditions, and yet just hours by private plane from Europe’s major hubs.